By a number of measures my photography has improved over the last year. My preferred subjective measure is to look at my images over the last 12 months and compare them to the previous 12 and see whether I feel there has been an improvement, and in this case I can see that I have improved, I have also developed a style and a certain maturity has crept into my images. STYLE – Having a style makes your work more recognisable, the key to developing a style is actually not trying to develop a style, just to take lots of images and a style will develop. Here’s a brand new one of mine which still needs some work on it, would you recognise it as one of mine? ORIGINALITY – I like to think that a lot of my images have some originality to them because of the model’s pose, props and the location. An image is rarely completely original, but the more elements of originality the more likely that other people (including photographic judges) will have a strong feeling about the image. They will either love it or hate it and for winning exhibition awards that’s where you want your images to be, rather than ‘nice’ images that are mainstream and pick up acceptances. Judges don’t seem to like this one. But judges love this one. EQUIPMENT – You will not find anywhere on my blog information on what equipment I use, and it’s not the latest and greatest camera that you’d expect. The key is to know all the capabilities and limitations of your equipment, and most importantly to be able to change settings blindfolded, so that you can very quickly make adjustments as the light changes without losing rapport with the model. The light was changing rapidly here, so while the model was changing poses I was constantly adjusting exposure and composition to make the most of it. 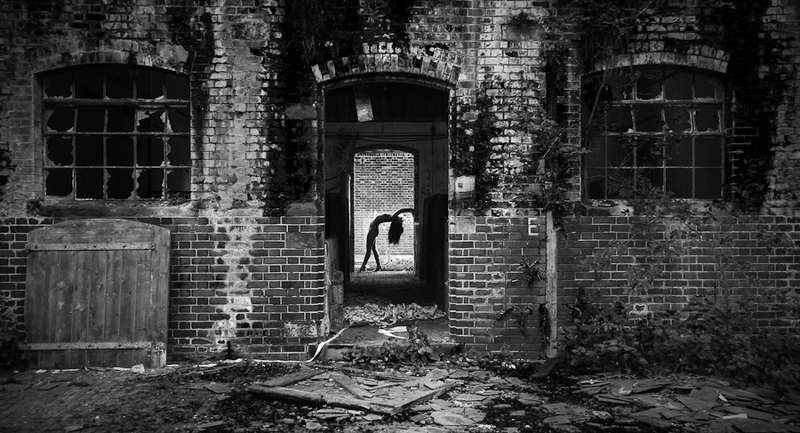 LOCATIONS – A model can do the same pose in two different locations and the pictures be completely different, so I spend a lot of time on Google looking for interesting locations. I am also extremely grateful to many other photographers who have freely told me of locations. This is a super pose, but I feel the location really enhances the image. JOINT SHOOTS – Many photographers like working by themselves with a model, and this is the way I often work. However I have also done a number of joint shoots, often with experienced photographers who have little or no experience of working with models. There are many advantages to these types of shoots; the model costs are shared and the non-shooting photographer can act as a spotter looking out for the public. I have also found these shoots very creative as I always learn something from the other photographer, and hopefully they learn some things from me. That’s how I manage to do so many shoots and yet still only spend as much each year as a wildlife photographer might spend on one 2 week photographic safari. PROPS – The human body can only make a fixed number of interesting poses in a studio, but if a model has a prop to work with this often gives them more scope to be creative and produce better images. I am always on the lookout for props at charity shops, sale items, or in the studio etc. Super poses here, but the use of the piano makes the images that bit different from the same poses on a studio floor, and the second one needs the piano to sit on to make the pose possible – thanks to Rob Southall for the use of piano. MODELS – One of the most important ingredients is the model. You spend a lot of money on equipment, then a lot of effort finding good props or a good location, but having a good model and matching the model to the location can make a huge difference to the quality and impact of the final image. Also some of the models with the highest modelling rates are also the most inexpensive models on a per image basis as you get so many great images from a shoot. So by all means skimp on your equipment but not on the model! I’m not going to put any sample images up in this section as you can see all the great models I mean by looking at my website or blog. Now this is not self-deprecation, but I honestly do not think that I have much talent, but I’ve got a heck of a lot of enthusiasm and I put in a lot of hard work, and I think those are two of the key elements of my success. A huge thank you to all the models and photographers I have worked with in 2012, and I look forward to making lots of new friends in 2013. May I wish you all a healthy, peaceful and prosperous New Year. Certainly agree about a maturity in your images now Tim, and many congrats on your all your awards, certainly well deserved. The elements are well described Tim but thee is also a lot of having an eye for an image too. Thanks Richard, and I’m sure we can work together. I think this post is more evidence that you should teach photography. You do have great talent because your sense of what looks good at the moment you click the shutter can’t be taught. Of course that’s just my opinion. Nice to hear from you Mr Pope and thanks for your thoughts. I am doing lectures for camera clubs and we shall see how that goes. I do it because I enjoy it and I wouldn’t want anything to spoil that. A most interesting post Tim. Originality is something that you have in spades. I have also read “The Art of Photography” and remember that particular quote – possibly the only thing that I remember from it! All the best for 2013 and I look forward to seeing some more ‘originals’ from you.